I Unfriended my Husband…But Should I Ask to Get Him Back? 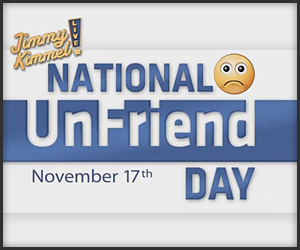 Yesterday was Jimmy Kimmel’s National Unfriend Day. My husband and I were sitting in our dueling armchairs during the Unfriend telethon last night and I joked that he wouldn’t even know if I unfriended him. You see… my husband is a Facebook poser. He has never posted a single comment, picture or update. He even calls himself “Pudger” a name I have NEVER used for him. I’ve called him lots of things, but never Pudger. So last night, on the prompting of a fearless late-night leader, I went to my husband’s so-called Facebook Page with the intent of unfriending him. We both laughed when I realized I had no idea how to do that. I sifted through the four birthday wishes on his wall and I made note of the fact that by unfriending him he would go from 15 to 14 friends. I finally landed on the prompt I needed to unfriend my husband. “Does it really matter?” he laughed. So I did it. My husband and I are no longer Facebook friends, and Jimmy Kimmel is right…I feel so much better to have the added weight of my husband’s creepy pictureless avatar filling up my FB friend list. Should I have kept him as a friend and bugged him until he started engaging in Facebook land, or does it matter that I have a world there that he might know nothing about? I have openly told my husband I will not friend him should he ever get a FaceBook account … which he will not. Yes, this is a world I engage in that he not only knows nothing about but has no desire to learn. Oddly enough, I am FaceBook friends with some of his real friends! Remember that 2009 movie and book, “He’s Just Not That Into You”? Well, “Pudger” just isn’t that into Facebook – and that’s all right! Just leave him unfriended; he really doesn’t give a rip.